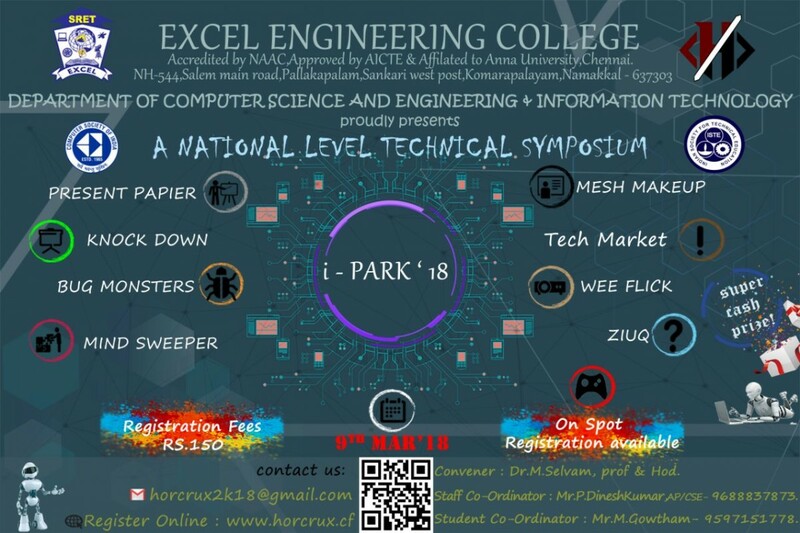 Excel Engineering College - Department of CSE & IT has organized a "Industry Explorer"
Excel Engineering College - Department of CSE & IT has organized a "Conference"
Excel Engineering College - Department of CSE & IT has organized a "Guest lecture on AI"
Excel Engineering College - Department of CSE & IT has organized a "Guest lecture on Software Platforms" on 15th March 2017 at Velappar Seminar hall,EBS Campus. Excel Engineering College - Department of CSE & IT has organized a "Guest lecture on Career Building" on 4th March 2017 at APJ Seminar hall,Excel Campus. The Inauguration of IT Association " TECHACKZ" -15 to be held on 25 July 2015, Saturday at 9.30 a.m @ Vellapar Hall A/C in Excel Campus. 3rd National Conference - Dept of IT organize "Networking and communication systems 2015" (NCS 15) to be held on 13th Feb 2015 @ Excel Engineering College. The In-house workshop focuses mainly on the aspects of manual testing and its approach towards the current industry. The techniques related to test case presentation and the follow-up procedures for doing manual testing have been discussed. The different views relevant to recent approaches to testing and the tools with industry standards have been listed and elaborated to the students. This workshop was a brainstorming session for the students. •	Cryptography & Network Security on 3.1.14. •	Java Programming on 11.7.13. • Awareness Programme on Open Source Software on 30.08.11. • Issues and Applications of High Speed Networks on 30.06.11 & 01.07.11. Guest: Mr.J,Santhanakrishnan, CEO, Commx Solutions, Chennai Mr.A.Sadagopan, Rtd Deputy Generalmanager Telecom, BSNL, Chennai. Chief Guest:Mr. Ravi Varadarajan,Sr. Country Technical Manager - Solid Works,Bangalore. Chief Guest: Mr. J.Santhanakrishnan,CEO,KNET Solutions,Chennai. Mr. A.Sadagopan,Rtd. Asst. General Manager,Business Development Cell,Tamil Nadu. Mr.A.Sadagopan,Rtd Deputy General Manager,Telecom BSNL, Chennai. Chief Guest:Mr. Anand Narayanan,Vice President - Essar Information Technology,Coimbatore. • Human Values on 22.01.11. Guest: Sri Aashrithaji, Oneness Universtity • Information Security on 25.08.10. Guest: T.Senthil prakash, AP, SSM college of engineering • Probability and Queuing theory on 25.03.10. • Probability and Queuing theory on 04.11.09. Guest: Mrs.JagadeswarProf/maths,K.S.R college of technology • Digital Signal Processing on 09.11.09. III Year IT Students went to Industrial visit at Indian Institute of Management, Kozhikode on 30.7.2015. Industry Explorer-15 (first edition) on 31.01.15.